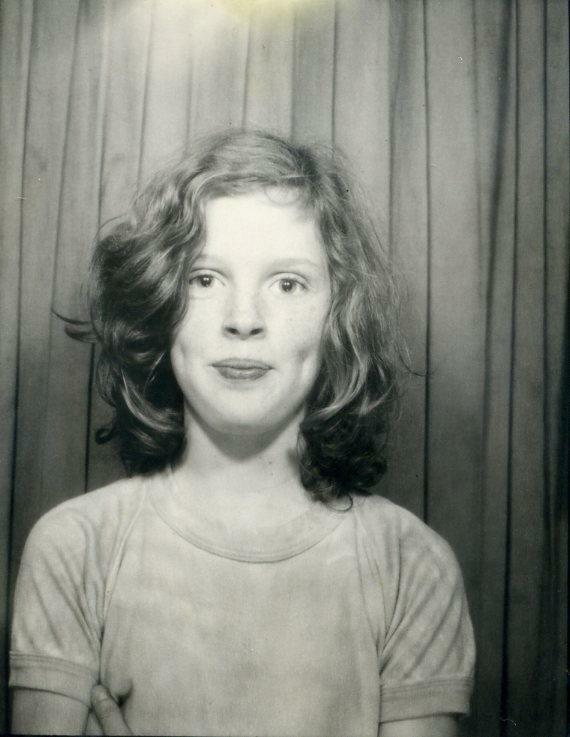 This is the earliest photobooth portrait that I still have. It was also the very first. It was taken at Melbourne’s famous shopping centre Chadstone. I was with a friend who kept three of the four photos. I cannot remember who it was. Possibly my neighbour in East Bentleigh, Helen Lloyd? Whenever I visited “Chaddy” with my Mum or Dad I would ask if I could get a strip of photos taken. They always answered in the negative. It wasn’t until I was there as an independent shopper that I managed to get my first fix behind the curtain. From the perspective of someone receiving five cents per week pocket money, I remember thinking that the photos cost a fortune. I think they cost eighty cents for a strip. I paid whatever my share was, in order to be allowed to keep this photo. I didn’t like it at all at the time but kept it none-the-less. I tie-dyed the t-shirt I am wearing in a craft class at school. I was in grade five. So so so so amazing. I adore this photo. I love the quirky smile, the sweet haircut and the beautifully innocent face. You look so content! Love this photo!!! How do you remember all that info?? I can’t remember yesterday ha ha!! Congrats on the Blog!! Have you looked at the two most recent posts?